Nose: very fresh, with lots of vanilla and some white pepper playing on the background. Reminds me a bit of Barbados rum, but with an edge. Fruity notes (red berries) and some cognac hints. After a good 15 minutes it all gest a bit more refined. Taste: Fresh and sweet with just a ltiile bitter edge that disappears after a good 20 minutes. Fruity, sweet candy and full flavoured. The nose said ‘Barbados’, but the mouth shouts ‘Jamaica’. Finish: Mediumlong, sweet and a bit herbal (rue). Too bad the finish doesn’t add any extra to the flavour. Nose: Dusty, a bit like the well known ‘old bottle effect’ in whisky. Wet stone. Sweet start, getting more medicinal. After 20 minutes: the dusty notes are gone now, it gets more typical rum. Soft and refined molasses. Herbal too (verbena). After 60 minutes: more alcoholic now. Soft vanilla. The medicinal touch only goes on on the background. Floral now (white flowers). Finish: One dimensional bitter, and medium long. After 60 minutes the finish gets a little bit softter, sweeter but also shorter. Our score: Now this is a difficult one. First of all….is this rum gone bad or not? 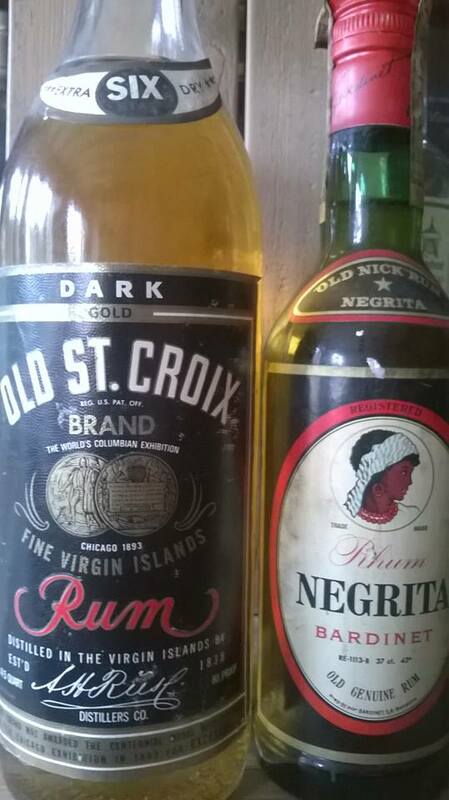 I should try some other Old St-Croix from that era to compare. Secondly…the rum changes a lot once in the glass. So I split up my score into 2. Initial score : * . After 90 minutes a ** .